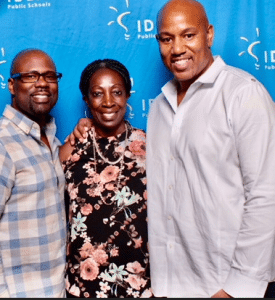 Florida – June 27, 2018 – When the Florida Department of Education (FLDOE) released schools grades on June 27 many charter schools teachers and principals had a reason to celebrate. Of the total number of charter schools graded on the A-F scale, a little over 67% earned an A or B , and more than 100 charter schools improved their letter grade and increased student achievement levels from the previous year. Many of the improved public charter schools — like Gibson Charter School, Glades Academy, Mater Academy High School of International Studies, Miami Community Charter, P.M. Wells Charter Academy, Renaissance Charter of Plantation, Somerset Academy Eagle Elementary and Middle, and Woodmont Charter — serve a large percentage of economically disadvantaged students. “My purpose is to do all I can for my students,” said Ms. Vinnisha Jones, Principal, Glades Academy. She grew up in Belle Glade (Palm Beach County) where her school is located. “I believe my purpose in life is to do all I can to serve my students and give them as many opportunities as possible to help them prepare for a better life.” In 2017-18, third grade passing scores increased by 17%, and the school improved two letter grades in the past two years. The state’s first charter school district – Somerset Jefferson – also made the grade. The K-12 not only raised academic performance but also worked hard to build a relationship with the community they serve. After years of failure and loss of enrollment, the Jefferson County School District was urged by the State Board of Education and the Florida Department of Education to relinquish control of their schools to Somerset Academy, a network of public charter schools. One year later, this historic charter school takeover of a high-poverty rural school district is proving successful. Somerset Jefferson elementary and middle schools went from D to a C; and the high school earned a B. “Our team is over the moon with the results. We congratulate our member schools and every teacher, parent, and principal who helped students make academic gains, close the achievement gap, raise graduation rates, and lift their overall school grade,” said Lynn Norman-Teck, executive director, FCSA. “We also need to recognize the many charter schools that made incredible gains in high-need areas — like Mater Academy High School of International Studies (Miami-Dade) where 77 and 64 percent of students improved their scores over the previous year in reading and math respectively; and the schools that improved a letter grade or more.” The FCSA team provided guidance and support to several of the schools that improved their overall score. According to the FLDOE’s school grades report, the A-F grading formula includes several components including achievement, learning gains, learning gains of the lowest 25% of students, middle school acceleration, graduation rate and college and career acceleration. 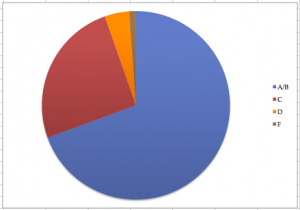 The number of schools statewide earning an A or B schools grew from last year. More than 3,200 schools were graded, and 1,027 received an A. 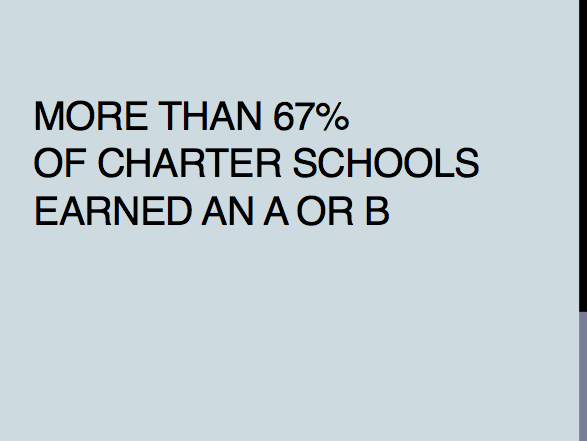 24 percent of those were public charter schools. Since 1996, public charter schools have been providing quality education options to families across Florida. According to the Florida Department of Education, charter school have helped raise student achievement, narrow the learning gap, and raise graduation rates across the state. A FLDOE report based on 2015-2016 data – Student Achievement in Florida’s Charter Schools: A Comparison of the Performance of Charter School Students with Traditional Public School Students –shows that charter schools are helping students succeed and, in many cases, those students are outperforming their peers attending district-run schools. In 65 of the 77 comparisons, charter school students demonstrated higher rates of grade level performance – scoring a 3 or better on the state assessments; and the percentage of students making learning gains was higher in charter schools in 82 of the 96 comparisons. Mrs. Edna Stephens, Principal, Everglades Preparatory in Pahokee is retiring in a couple of weeks. Anne Williams Dorsey (standing) is the school’s incoming principal. They’re working together to prepare for smooth transition. There are also many alternative and exceptional student education (ESE) center schools throughout the state. Those programs receive improvement ratings of Commendable, Maintaining, or Unsatisfactory, instead of a letter grade. Their rating is based on student learning gains for English language arts and/or mathematics — including retake assessments and concordant scores. Several alternative charter schools including EdVenture Charter, Mavericks Palm Springs and Everglades Prep in Palm Beach County received a Commendable rating this year. 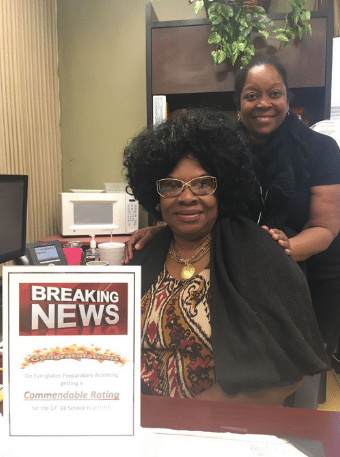 Edna Stephens, principal at Everglades Preparatory, was thrilled with her school’s score – a testament, she said, to her team’s hard work and the students’ focused determination to succeed. 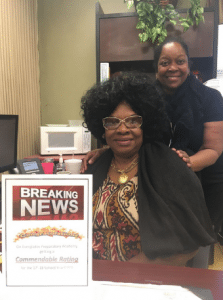 Mrs. Stephen will retire in a couple of weeks, but she leaves on a high note having helped her school earn high marks from the state. Five alternative high schools under the operation of international education service provider EdisonLearning earned the highest rating of “Commendable” — raising their overall performance. The school grades, said Commissioner of Education Pam Stewart in a press release, “are the result of hard work by our students, parents, teachers and leaders…I am extremely proud that Florida’s accountability system continues to ensure all students have access to the high-quality education they deserve and that it prepares them for college, a career and life.” FCSA couldn’t agree more. “For more than 20 years, public charter schools have been a vital part of Florida K-12 system of education. We are more committed than ever to the more than 290,000 students we serve and the communities who depend on us,” said Ralph Arza, FCSA Director of Governmental Affairs. Somerset Academy Eagle Campus team (left to right) Principal Tunji Williams, Jack-of-all-trades/Administrative Assistant Lesia Owensby , and Vice Principal Joe Parker. The state letter grades are available on the Florida Department of Education website.